So he turned his back, and sat by his window looking out over the sea, and weeping great tears for his lost daughter, till his white hair and beard grew down over his shoulders and twined round his chair and crept into the chinks of the floor, and his tears, dropping on to the window-ledge, wore a channel through the stone, and ran away in a little river to the great sea. Meanwhile, his granddaughter grew up with no one to care for her, or clothe her; only the old nurse, when no one was by, would sometimes give her a dish of scraps from the kitchen, or a torn petticoat from the rag-bag; while the other servants of the palace would drive her from the house with blows and mocking words, calling her “Tattercoats,” and pointing to her bare feet and shoulders, till she ran away, crying, to hide among the bushes. But when he heard the King’s command, he dried his eyes and bade them bring shears to cut him loose, for his hair had bound him a fast prisoner, and he could not move. And then he sent them for rich clothes, and jewels, which he put on; and he ordered them to saddle the white horse, with gold and silk, that he might ride to meet the King; but he quite forgot he had a granddaughter to take to the ball. Meanwhile Tattercoats sat by the kitchen-door weeping, because she could not go to see the grand doings. And when the old nurse heard her crying she went to the Lord of the Palace, and begged him to take his granddaughter with him to the King’s ball. Weeping over her ill-success, the old nurse went to look for Tattercoats; but the girl had been turned from the door by the cook, and had run away to tell her friend the gooseherd how unhappy she was because she could not go to the King’s ball. “Even cripples can dance when they choose,” said the gooseherd. “Good company, indeed,” said the gooseherd, and played a new tune that was not a dance. It was a curious tune, and it made the strange young man stare and stare and stare at Tattercoats till he couldn’t see her rags – till he couldn’t, to tell the truth, see anything but her beautiful face. But the more she refused him the sweeter the pipe played, and the deeper the young man fell in love; till at last he begged her to come that night at twelve to the King’s ball, just as she was, with the gooseherd and his geese, in her torn petticoat and bare feet, and see if he wouldn’t dance with her before the King and the lords and ladies, and present her to them all, as his dear and honoured bride. But as they came in front of the throne Tattercoats’ lover rose from beside the King, and came to meet her. Taking her by the hand, he kissed her thrice before them all, and turned to the King. 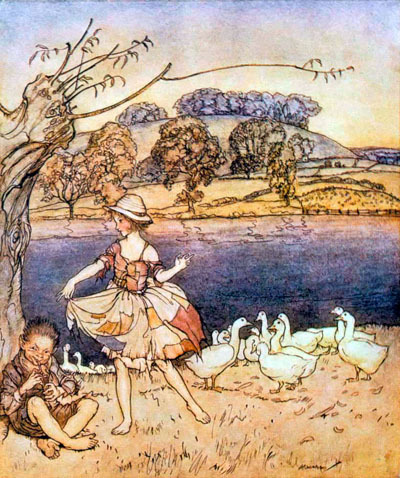 Before he had finished speaking, the gooseherd had put his pipe to his lips and played a few notes that sounded like a bird singing far off in the woods; and as he played Tattercoats’ rags were changed to shining robes sewn with glittering jewels, a golden crown lay upon her golden hair, and the flock of geese behind her became a crowd of dainty pages, bearing her long train. But the gooseherd was never seen again, and no one knew what became of him; while the old lord went home once more to his Palace by the sea, for he could not stay at Court, when he had sworn never to look on his granddaughter’s face. So there he still sits by his window, – if you could only see him, as you may some day – weeping more bitterly than ever. And his white hair has bound him to the stones, and the river of his tears runs away to the great sea.